The death toll is still rising as first responders search for survivors of the massive wildfire that ripped through the resort towns of Gatlinburg and Pigeon Forge, Tennessee, beginning Monday. As state, local, and emergency officials begin working to rebuild the popular resort town located at the foot of the Smoky Mountains, many are wondering how they can help support those who lost family, friends, and property in the fire. Luckily, there are many ways to help Gatlinburg fire victims — and several of them can be done right from your computer or phone. At least 10 people in Tennessee are dead, with several still missing, and at least 76 people reported to a local hospital for treatment of injuries connected to the fire, according to CNN. 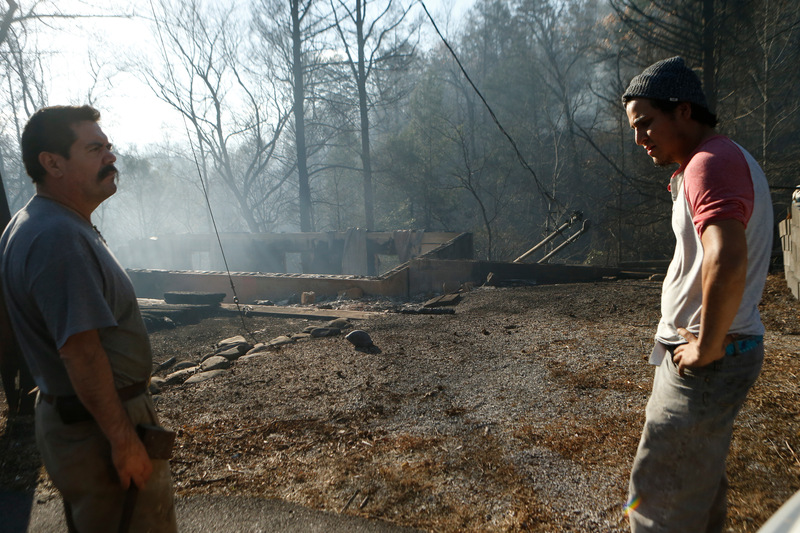 The blaze has destroyed more than 700 structures and 17,000 acres in Sevier County, located in eastern Tennessee. The American Red Cross has requested a pause in donations of physical goods, like water bottles, canned food, clothing, and extra blankets, The Tennessean newspaper reports. Organizers on the ground say they have enough in-kind items to address the immediate needs of survivors, and are encouraging supporters to instead make a financial donation to the Red Cross. Any amount is appreciated, and you can make an instant $10 donation by texting "REDCROSS" to 90999. You'll get a text back asking you to confirm your donation — simply reply with "YES" and the donation will be charged to your phone bill. Several local organizations are partnering with the Red Cross, including First Tennessee Bank, which has offered to match donations up to $50,000. Donations can be made any any First Tennessee Bank branch in the state. Grocery chain Kroger is also accepting donations for the East Tennessee Chapter of the American Red Cross, in addition to making a $10,000 donation on behalf of the corporation. The Tennessean reports that "donations will be accepted at all Middle and East Tennessee Kroger stores, Northern Alabama Kroger stores, and Southern Kentucky Kroger locations. All money will be forwarded directly to the East Tennessee Chapter of the American Red Cross." Other local organizations from across the state have also stepped in to help those impacted by the fires. The Community Foundation of Middle Tennessee has launched a fundraiser that it promises will go directly to those impacted by the fire. Formally called the "Gatlinburg, Pigeon Forge, Sevierville Emergency Response Fund," the organization will use the funds to distribute grants to "nonprofits providing assistance both in the immediate and long term," the fund's donation page explains. There's even a T-shirt you can buy that gives proceeds to the American Red Cross. As residents nervously await news of family and friends still reported missing, several people have created GoFundMe campaigns to support the lengthy recovery process for individuals who were injured, or who lost their homes or businesses in the blaze. One particularly heartbreaking story involves a trio of brothers who, while fleeing their home, became separated from their parents. Branson, Wesley, and Jared Summers are all still in the hospital being treated for injuries sustained as they tried to escape, but their parents had not been accounted for. It was recently discovered they died. Family and friends set up a pair of fundraising campaigns for the beloved local musicians, including a GoFundMe and YouCaring page. At press time, the GoFundMe campaign had raised more than $8,000, while the YouCaring page has raised more than $36,000. As the residents of Gatlinburg slowly rebuild their community, they will continue to need support. In the immediate wake of natural disasters, charitable donations often spike, but then dissipate as the tragedy fades from the headlines. If you're able, set up recurring contributions to any of the funds mentioned above to be sure you can keep helping those in need.